Since my last post, I have gone through and finished a first edit run on my short story which also added at least another 1,000 words to it. Once again, I am very happy with the result. This happened after I confronted one of my greatest worries about writing – having other people read it but I was told over and over and over how important it is to have someone else read your work. Another set of eyes to look through it and help point out mistakes or issues that need to be resolved prior to submission. I had the chance to have it read by a writing group I belong to and while it was difficult I did survive it. It was not easy at first but thankfully some kind words from my fellow writers helped get me through the session and I am so very glad I did. While the discussion moved on, I sat and thought about their suggestions and made sure to write down what they had said. Parts that needed to be clearer to readers so they can understand what was happening in the story and its characters since it seems I did not put everything in my head onto paper. In the end, I do believe that it has turned out even better then the rough draft – isn’t that the point of writing groups and edits though? Now, I have sent it off to one more set of eyes to read through before the next edit. Making this the furthest, officially, the furthest I have gone with my writing. Only a few more steps until I submit for the first time. Most importantly these steps need to get done prior to school starting in a few short four weeks. This coming semester will be the beginning of my last year of school (hopefully) and my plate will be incredibly full. I have already come to the conclusion that my novel rough draft will not be done by the date I had originally selected for my own personal deadline. Part of this was deciding to write the short story – the other part is that other parts of life have taken importance over writing. I know, it is insane isn’t it?! But now I am back on schedule and still have a deadline it just had to be pushed back a few months. Now back to writing! For the last month or so I have taken a break from my novel. I learned about a magazine looking for short sci-fi stories and decided to take up the challenge. It hasn’t been easy and I am not sure if it will pass the muster as being sci-fi because it doesn’t really deal with space or lasers. I wanted to make it feel like an regular moment in life today it just happens to take place in a future location. I am enjoying this. I have a hard time with short stories – I want to put so much detail into what I write that to do this I have had to hold myself back from my normal writing style. It is weird writing the words “my normal writing style” – especially since I have a hard time saying I am a writer. I have never published anything beyond a few poems for anthologies in school. I have never won an award. And all those fun things. Hell, I have never finished anything large. Maybe short stories will help with this? I have written and finished several short stories in the recent months. Two for school and this one. I am glad though that I have a bit more freedom with this one. The school ones were limited to 3-5 pages. This time its 3k-5k words (about 13-18 pages). OH! And I am still going to finish that danged novel! I love being inspired. It happens to me constantly. I love it when it happens. When I am sitting there doing something and then suddenly a see something that pokes at my imagination. I can go the rest of the day, or weeks, building a story in my head. Many times these moments do not ever get written down – at least not in the past. I am starting to write down these little bits in my head since I have finally come to the point where I just don’t want to lose them. While I am working on editing my book – I am slowly building up stories on the side from these moment. Last time I wrote I had one story beginning and now I have two. As well as a short story I am working on that has a deadline at the end of the month. I am wondering though if some of these ideas would be better suited in short stories. Something I could mix in with my poetry for a book. These moments remind me a lot of writing poetry. When you are sitting there and the muse begins to whisper in your ear. It is one of the best things about poetry to me. I am not an epic poetry writer – I have nothing on someone like Whitman – but I did spend a good hour the other day creating limericks with my son, who found them incredibly funny. There are times, I wonder if this is the same for everyone else who writes or creates. I am just now getting to know other writers, since I have spent most of my creative life in a self-induced isolation from the creative world and I find it fascinating to learn how they create. Everyone has something different to bring to the world of stories and they come to it in different ways. The art of creating a mental world is amazingly beautiful to me. p.s. for some reasons I have the song “Reproduction” from Grease 2 stuck in my head… but the word reproduction has been replaced with Inspiration. Two weeks ago was the end of the Spring semester of school which means it is time for Summer FUN! Or a chance to have more time to spend with my family and work on my novel. The last semester was a tough one but I got thru it with semi-flying colors. Of course, all I want to do sleep and play video games but instead I am forcing myself to open my computer and get back to work on my current book. It has not been easy since it has been months since I have had a chance to write anything but papers for school or assignments for my writing class and I fell into the trap that happens often when you have to leave a story for a period of time — memory lapse. Yep, I have found that since I am not just writing but have decided to continue the editing from Chapter One and when I found a gap that needed to fill in I forgot several of the names of my characters. This made me glad that a few weeks ago I had printed out all of my information I had written up for the book. Background notes, plans, character profiles, etc. I had been told to write everything down in the past and I am glad I followed this advice not just because it is helping me with organization but also for event such as this. When you know the character but you forget a detail now all I have to do is flip to the book bible. I will say the other issue for me at the moment is my desire to start a new story. Often inspiration is like lightning sometimes and that is what happened for me. I was researching a paper for school and inspiration hit me, as it usually does when I was reading something fascinating, for a story series. I just don’t want to get carried away with it though because I would end up abandoning my current work and I am determined to finish it. This has been issue for me in the past. I would jump from one story to the next one when I found a new story I wanted to tell. Instead, I am just working on the notes, writing down a few passages as I become inspired when I need a break from my current work. At least the one thing I got done in the last few months is work on the prologue for my book. I had signed up for a writing class this past semester at school (plus to being an English major) and for our fiction piece I decided to work on this short section instead of writing something new. It turned out well. It helped me focus that aspect of the story and flesh out the history of the book more. I am proud of what it became and the response I received from it. I also signed up for some writing groups – one for mommy writers – people in similar position as me. Trying to balance writing with mothering. It isn’t easy. A lot of my free time this summer is being taken up by taking my son to soccer, swimming, and art lessons, as well as travel. It so incredibly worth it… and it makes my son happy as well. And now, back to work. kiddo is sleeping and I only have an hour left to work on this chapter. To get an agent, sell your book to a publishing house… leading to success is often the main dream of most writers. I know it is mine and I don’t even call myself a writer at this point. I consider myself to be someone who is attempting to become a writer. Mainly because I am unable to make writing a priority in my life due to attempting to gain my bachelors (hoping for Spring 2015!) and being a wife-n-mom. Sleep is necessary as well. In truth, I have only had the minimum amount of time to work on my novel because of my work load over the past few months. I have been playing with the idea of going the self-publish route with publishing some of my poetry as I work on my novel. In my office is a box full of old journals, loose sheets of paper, old works that have piled up over the years. I have published a few in small contests while in school over the years. I believe in that pile, somewhere, is the first poem I ever had selected for an anthology when I was in 6th grade. Maybe it is time to sit down and rework those poem with the mind of a more mature me? When I think about the idea of publishing my poetry, it is scary. I rarely let anyone hear or read my poems. They are extremely personal and the few times I attempted to gain entry into the poetic culture I was often met with scathing looks before I even had a chance to share my work. But now, I am to the age I am not sure I care about the reaction. I have wanted to publish something since I was a child. I wanted to create work that would be enjoyed by others. The idea of putting something out there for others to read is one of the scariest things I will probably ever do with my life. But do it I must. Yes, one day I may finish my science fiction series and get to publish it. But why not grab the bull by the horns to finally put my words to print with my poetry. Now I can stop playing with the idea and instead actually do it. Focus and get it done. While I do that, I am working on revising my draft so far on my book in between writing my papers for school. Seriously… tell me in the comments how he caught the turkey. Just freewrite – no thinking. 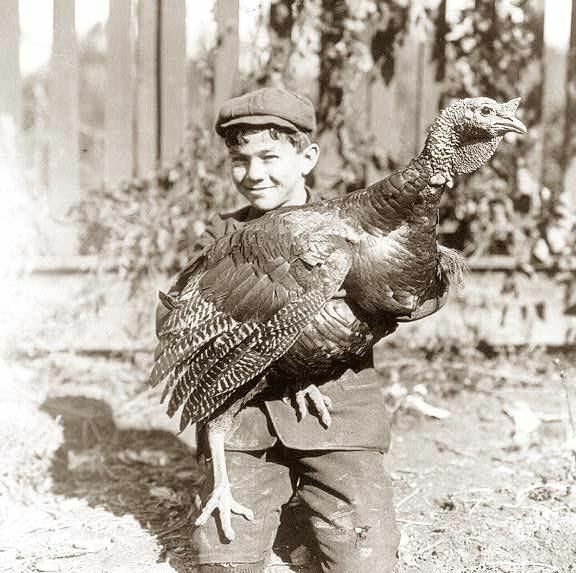 Look at the photo and write something short about the boy and the turkey. As we are on the verge of another NaNoWriMo – I look at those that are going to do it and wish them luck. I have never had the time to do it. I can look at my schedule and know there is no way I could have the time to get it all done. Currently, I am in my 4th month of working on my novel and only about a 1/3rd of the way through. With school, I am lucky if I get a few nights a week. Of course, it doesn’t help that sometimes I need to just zone out and end up falling back into the world of Sims just to get away from it all (cheaper than a vacation). I am writing though, and that is the important thing. I have added several new chapters to my novel and have fleshed out the story so damned much its beautiful to me. I recently went to a Writers Conference and loved it, I was surrounded by all these people who had achieved the same dream I had. When I had gone, I was kind of trudging through the swamp of my novel but by the end I had become re-inspired to keep going. I even spent several sessions working on background for my story. I love taking this story and making it realistic to the reader. Going over details with my husband because he is a wonderful sounding board for me. I am also feeling more confident in my writing and the story, having had a chance to talk about it to other people outside of my small group of family and friends. I would recommend conferences to anyone wanting to write because it is a wonderful experience. Maybe one day I can get into a writers group. What is going on with my story? I have gone from a single person view-point to multiple… 3 females and 1 male. I do feel bad because out of all them, she is having the worst time ever in a story of some really bad times but it is really interesting to write her story. It is interesting fitting the different stories together, making sure the timeline matches up and that you have the details right. You can’t have someone seeing something happen that hasn’t happened yet or too far in the future – I have done this a few times already. I have also found that some of my characters are unnecessary to put into the foreground and have gone to very minor roles, whereas a minor character that I thought was a throw away one and I thought I would delete now has a major role that is becoming very vocal in the story. That right there is why I am enjoying this story, because it feels like it has a life of its own sometimes. But I have learned that giving everyone a distinct voice is WAY more difficult than it sounds but it can be fun trying to figure out their personalities.